Working capital is on the balance sheet. It is part of Operations. DEBT + EQUITY = WORKING CAPITAL + NON CURRENT ASSETS. A balance sheet contains funding and operating items. Funding items includes equity and debt. Operating components include working capital and non-current assets. Working capital consists of Current Assets and Current Liabilities. These are defined below. This is money owed to the organization by customers. It appears on the balance sheet under current assets. The balance sheet amount for Accounts receivable is related to the sales amount in the income statement / profit and loss. It is the amount of sales that have not yet been paid for. It relates to credit sales only. (Cash sales would appear on the balance sheet under Cash at bank). The money owed to the organization by customers is expressed in days. This is the stock of goods available for resale, valued at the lower of cost or net realizable value. The balance sheet amount for inventory is related to the cost of sales amount in the income statement / profit and loss. The stock of goods available for resale is expressed in days. This is inventory of consumables. The stock of work in process valued at the lower of cost or net realizable value is shown here. This is the work in process amount expressed in days. The balance sheet amount is valued at the lower of cost or net realizable value and is related to the cost of sales amount on the profit and loss. Current assets that are not included above are entered here. This is money owed by the organization to suppliers of inventory and other variable cost of sales. 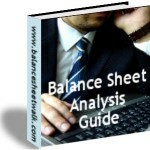 Accounts payable appears on the balance sheet under current liabilities. The balance sheet amount for Accounts payable is related to the cost of sales amount and expenses amount in the income statement / profit and loss. It is the amount of goods and services that have not yet been paid for. This is the Accounts Payable amount expressed in days. Provision for tax is a liability. It is tax payable arising from the current years operations but not yet paid.Provision for tax is not a funding provision because it is closely linked to the trading cycle. It is entered as part of working capital on the operations side of the balance sheet as “income tax liability”. Accruals are current liabilities and relate to fixed expenses which were incurred but not paid for in the period shown. They can be expressed as a percentage of fixed expenses. This is used for current liabilities that are not included above. Traditionally working capital includes cash at bank and bank overdraft. Financial analysis demands a change in the format so that the funding components of the organization are separated out. For a company to have working capital the current assets must exceed the current liabilities. Working capital management is managing the use of current assets and current liabilities to make the most of the business’s short-term liquidity. There is a direct correlation between business performance and working capital management.